This addition to the Fast Facts series provides a succinct guide for nurses in adult-health clinical settings and fills the need for an easy-to-use clinical reference that delivers a quick-access reference on ways to incorporate wellness into their work, helping to improve patient outcomes, and throughout their daily lives, helping to reduce personal and professional stress and improve their overall wellness. There currently is no clinical reference book that nurses can use for health promotion in general and health promotion for wellness in particular. 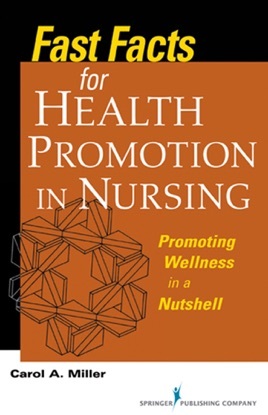 Having such a reference is especially pertinent to nurses who learned about health promotion in academic nursing programs, but did not learn about health promotion in the broader context of promoting wellness. Since Florence Nightingale, nurses have considered health promotion interventions - particularly patient education -- as an essential component of nursing care. Historically, these interventions traditionally focused on physical health concerns, such as nutrition, exercise, and fresh air, and more recently, on immunizations, and screening for disease (e.g., cancer, diabetes, hypertension, and cardiovascular disease). Because health promotion has expanded to include "wellness," nurses now address issues related to broader aspects, such as stress reduction, body-mind connectedness, and self-responsibility. At the same time that wellness has become an important focus of care, health care providers increasingly are emphasizing cost effectiveness and use of advanced technology. As a result of these concurrent trends, nurses experience high levels of job-related stress and have less time to promote patient wellness as an integral part of their care, even though they recognize its importance. In addition, nurses increasingly recognize that job-related pressures negatively affect them personally and they are looking for ways to incorporate wellness in their work and personal experiences.